Hello, friends. Did you know that Out in Harmony starts up again soon? Rehearsals resume on Tuesday September 4, which is not that far away! I hope you can all join us, including those of you we haven’t seen for a while. New folks are welcome at any time, but it’s nice to get right in on the beginning of the new music, so this is a particularly great time for you and your friends to come out and try singing with us. Rehearsals are on Tuesday evenings, from 7:30-9:30 (with a short break for snacks and socializing in the middle). We meet at St. Margaret’s Cedar Cottage Anglican Church, located at 1530 E. 22nd Ave, Vancouver. It is at the corner of Dumfries Street, near the intersection of Knight and Kingsway, and easily accessible by the 19, 22, and 25 buses. Please be aware that rehearsals are held in a scent-free environment, with no hemp, hazelnuts, guava or menthol allowed. We like for everyone to be able to breathe! We are also wheelchair accessible. Our next concert will be on January 26, and it will feature music written by those who tend to be outside of the spotlight: LGBT folks, people of colour, and women. You can start thinking in advance about possible solo and small group ideas. And for those who like to keep track of such things, the September job rotation is: Altos on set-up, Tenors on snacks, Basses on clean-up, and Sopranos taking a break. (Though of course you all can feel free to bring snacks to the first rehearsal, as we’ll have a longer break in which to greet each other. Please remember to list the ingredients on any snack you bring, and be sure that your snack does NOT include any hemp, menthol, guava, or hazelnuts). This is going to be a great season, and we look forward to seeing you all! There will be picnicing starting 6:30 p.m. on the grass close to the Coal Harbour Community Centre. To get there, just keep going towards the water, (Harbour Green Park 480 Broughton Street). The movie itself starts around 8:30 if you’re not able to join us for dinner. Bring blankets to sit on and sweatshirts as it does get chilly, and nibbles (food of whatever sort, as always with ingredients labelled to help out those will allergies), or just your fabulous selves. Friends, sweeties, prospective choir members and the like are all welcome. We can’t wait to see you there! in town, sign up to take a shift so we can make sure we are covered. until 11:30, but there are some fellow-venders wandering around. period so we can take turns watching both the parade and the booth. out info about the choir. Take down will probably be 6:30. To volunteer, reply to this post or contact the site (oihwebsite at gmail dot com) and we’ll put you in touch with Denise. Out in Harmony will be at the Outgames! The Outgames are being held during the last week of July in Vancouver this year, and Out in Harmony will be performing at the opening ceremonies! We are inviting all our friends to come join us as we form a mass choir to kick off this exciting event and show the world what a great choral city Vancouver is. We will be performing O Canada as well as one other piece. We will be holding 2 rehearsals prior to the Opening Ceremonies, and everyone participating needs to come to at least one rehearsal (though preferably both). Rehearsals: Tuesdays at 7:30pm at the Vancouver Film School – 198 W. Hastings - Tuesday July 12th and Tuesday July 19th. Everyone participating MUST attend at least one of these rehearsals. Please pass this on to all your singing friends who may be interested, and email our director Nicki at oihdirector@gmail.com if you are planning on participating or if you have any questions. This is going to be so fabulous! We look forward to seeing everyone and taking advantage of this wonderful opportunity to gather together, sing, and show the world how Vancouver is brimming over with both music and pride! Volunteer to LOL with us! If you are interested, please email the volunteer coordinator at sarahelps@live.com by June 7 letting her know you’re interested and if there are any restrictions on what you can or can’t do. Thanks and hope to see everyone there. Upcoming Appearance: Raise Your Pride! 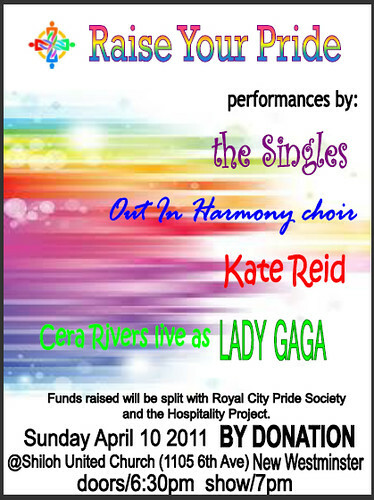 Out in Harmony will sing at the “Raise Your Pride” fundraiser this Sunday, April 10, to help raise funds for the Royal City Pride Society and the Hospitality Project. The show is open to the public and admission is by donation, so any friends and supporters of the choir would be welcome to take this opportunity to see us perform while supporting a terrific cause. Donors play an important role in helping us bring music to the community. Concert ticket sales cover only a part of our operating expenses, so charitable donations play a crucial role to the existence of the choir. Financial support allows us to rehearse and perform, serve our community, tour and cover operating costs. We are deeply grateful to those of you who donate to ensure our success. Out in Harmony is registered federally as a charitable not-for-profit organization, and provincially under the Society Act of the Province of British Columbia. Out in Harmony wishes to thank the following donors for their general financial assistance in our nineteenth season. Aliqua is having a full length holiday show at the Vogue on Sunday, Dec 12th, at 7:30pm and OiH members are eligible for a special rate on tickets. Instead of $35, any member of a choir can get tickets for $25 each.